This Contact Form is not considered "secure" but can be used to contact our office about non-confidential topics, such as an address change or a general question about the practice. If you need to schedule an appointment, refill a medication, or need to communicate to the office about your health, please call the office directly at 503-371-3232. Another option for current patients is to sign up for Patient Portal which will allow for secure communication with West Salem Family Practice. Call or stop by the office for more details. 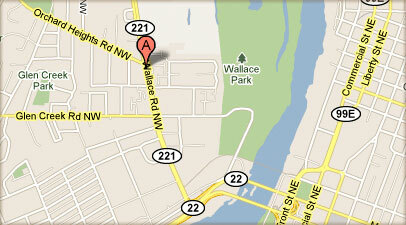 We are located off of Wallace Road in West Salem. If you would like customized directions just click on the map to load a Google Maps page. *Who was the last primary care provider and what is the reason for the change? *Do have any chronic medical issues that we should be aware of? If yes, what are they? *Were you referred to West Salem Family Practice? If so, by whom? *Are you needing to be seen soon? If so, what is the reason for the visit? Please note that processing time usually takes about five business days to complete and then we will contact the person making the request. Note: Please call the office rather than using the contact form if you need an immediate response. Thank you.